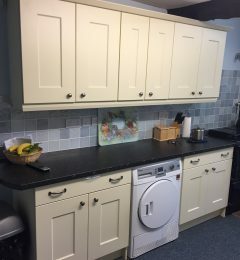 The Cambridge Ivory kitchen as with many budget kitchens we are able to provide is very popular as it is available made to measure at off the peg prices. 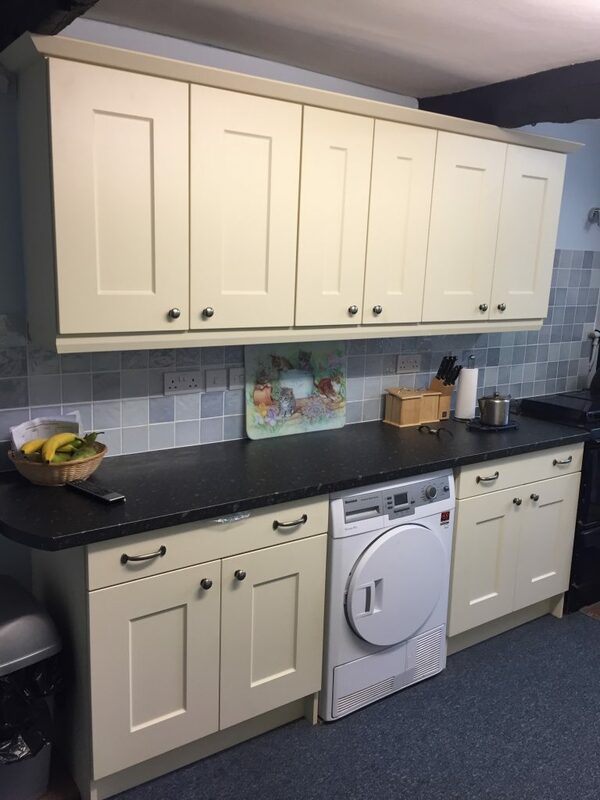 This Cambridge kitchen is available in twenty or so colours. Our client selected the Ivory as it is a clean colour that reflects the light without being a high gloss. The Cambridge door design is easy to clean despite having a pronounced centre panel. In Dunkeswell Devon, we installed this Cambridge Ivory kitchen with a 40mm laminate worktop and one and a half bowl stainless steel sink. The client elected to have her appliances built into the new kitchen,this saved a significant amount of money of course. Why replace the appliances when they are fine? 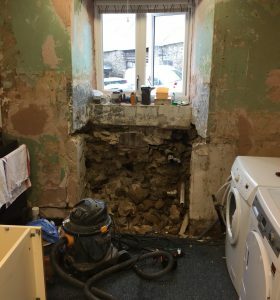 This kitchen came to a less than £6,000 including vat. A good serviceable kitchen built into a very difficult room with precision. 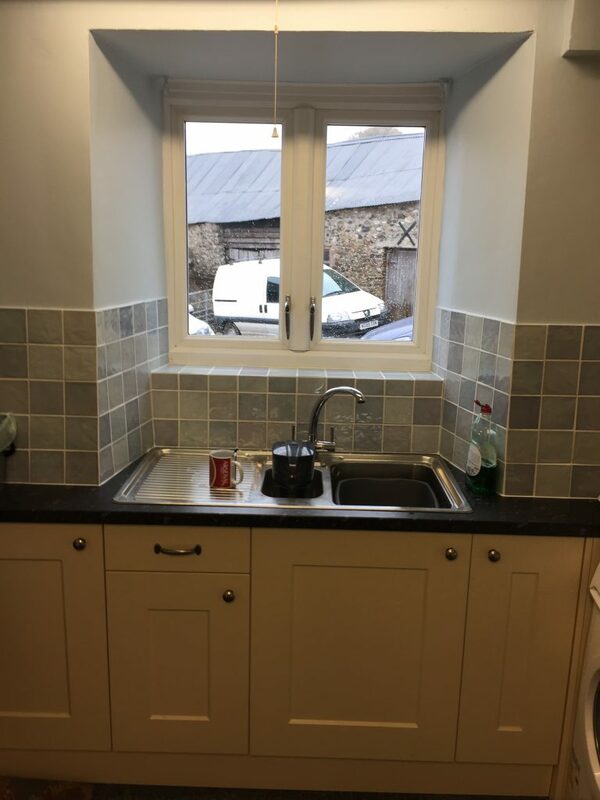 The room into which this new kitchen was fitted is a typical Devon farmhouse kitchen. Uneven, floors, walls and ceiling; with prewar plumbing. The walls were stone and thicker at the bottom than the top. The beams to the ceiling above were bent and unlevel. A great project for us at Martha Mockford, a challenge in all respects. Surveying and specifying is an art that one gets to learn after twenty-five years. In a modern home, the rooms are nearly square and often level, one can easily find reference points from which to measure. In a Devon Farmhouse things are different. Often the corners of the room are rounded, and the walls are not upright; so where does one measure from? Experience tells one that measurement is an art, not a science. 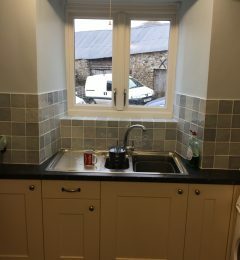 In this particular kitchen, the sink had to be placed in the recessed window, and the worktop to that side of the room had to meet the Raburn correctly. When faced with significant survey issues one has to be very careful indeed to check and check again. We survey at the initial on-site meeting to generate a design and specification for the kitchen. When the kitchen design and price are agreed we then call again and survey the room again and adjust the design accordingly. as you will see from the drawing and specification links below you will note that we were able to model the exact outcome despite the difficulties of the shape of the room. Neil Wilson carried out the kitchen installation. Though the kitchen fit itself only took a week or so, the room took a bit more time to sort out. The featured image to this page shows Neil’s essential equipment a vacuum cleaner! Older properties certainly have their charm; behind the sink is not where to look for it, though. 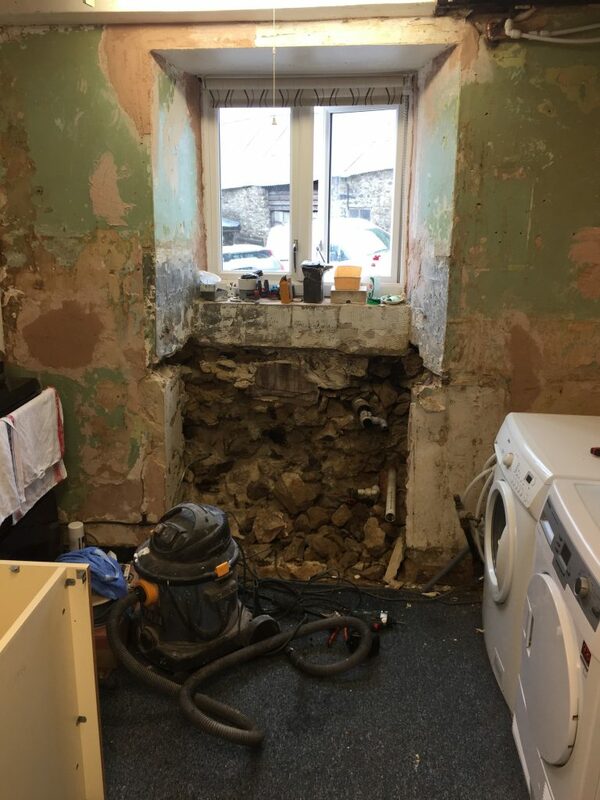 On removing the sink base Neil found a total mess that needed bricking up and replastering. You will see in our gallery here the finished sink recess. Kitchen fitting is not carpentry, plumbing, electrical or brickwork. Kitchen fitting is all of these and being a nice guy one enjoys having in the house. 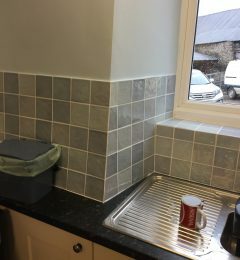 I believe the pièce de résistance in this kitchen in excess of the design work and building work is Neil’s tiling. The detail Neil has achieved here is phenomenal. You will note to either side of the sink the walls are not verticle or perpendicular into the recess. The tile joints to the corners taper making every tile cut a precision cut. This quality is not achieved through snapping tiles over a match. The tiles are processed with diamond saws and grinders to ensure precision size and refurbish cut edges to a near factory standard. 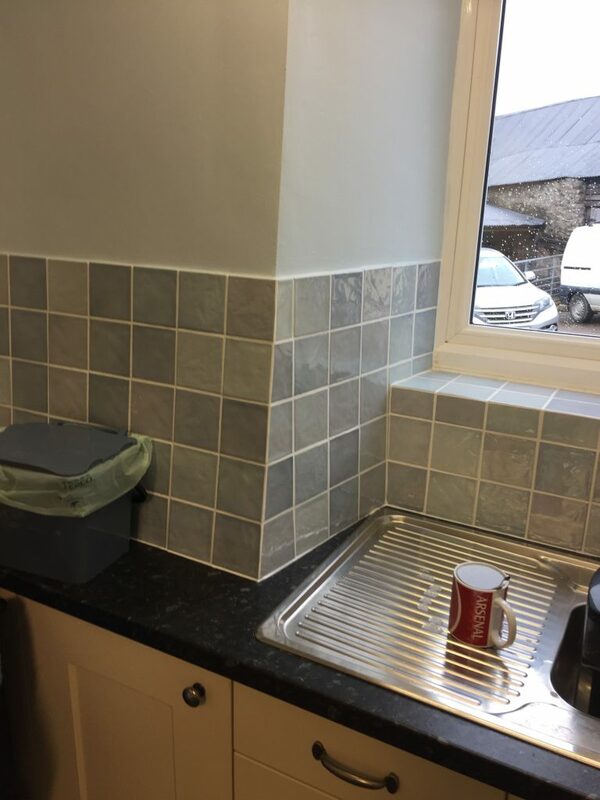 The only place in Devon where you can get this sort of design accuracy, specification, and fitting quality is at Martha Mockford. This kitchen was less than £6,000 including Vat. The link to this kitchen on our website is here.